548 pages | 110 B/W Illus. Modelling Survival Data in Medical Research describes the modelling approach to the analysis of survival data using a wide range of examples from biomedical research. Well known for its nontechnical style, this third edition contains new chapters on frailty models and their applications, competing risks, non-proportional hazards, and dependent censoring. It also describes techniques for modelling the occurrence of multiple events and event history analysis. Earlier chapters are now expanded to include new material on a number of topics, including measures of predictive ability and flexible parametric models. Many new data sets and examples are included to illustrate how these techniques are used in modelling survival data. Bibliographic notes and suggestions for further reading are provided at the end of each chapter. Additional data sets to obtain a fuller appreciation of the methodology, or to be used as student exercises, are provided in the appendix. All data sets used in this book are also available in electronic format online. This book is an invaluable resource for statisticians in the pharmaceutical industry, professionals in medical research institutes, scientists and clinicians who are analyzing their own data, and students taking undergraduate or postgraduate courses in survival analysis. "Now in its third edition, Collett’s book provides a comprehensive overview of survival analyses and extensions. The book has been expanded considerably; it has increased to 532 pages from the 395 pages in the second edition. Most notably, Collett has expanded his chapter on the Cox regression model and added more information on extensions to standard survival analyses such as frailty models, competing risks, multiple events, and event history modeling…A strength of this book is the author’s emphasis on diagnostics and model-checking and the integration of thorough references to other works so the reader can seek more background or additional information as necessary. As Collett describes it, he is aiming his writing at an intermediate level. This book is quite well written and straightforward to follow, but does require some statistics background of the reader…this book is definitely worth a look for anyone who teaches or conducts survival analyses. It is an excellent resource for applied statisticians and biostatisticians, and has strong potential as a textbook for upper-year statistics undergraduate or graduate-level courses in survival analysis." 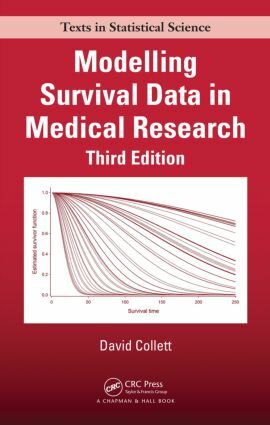 "The third edition of Dave Collett’s book enhances its position as a superb introduction to the area of survival analysis for medical statisticians, academic statisticians, their students, and statistically aware medical practitioners. It is easy to read and has clear explanations and enough mathematical material to satisfy the statistician but not too much that it would deter others. The extra material added since the second edition keeps this book at the forefront." "This is an excellent book, which should appeal to anyone involved in quantitative medical research or research training. Earlier editions have already established this remarkable book as a standard reference to one of the most important topics in medical research: survival analysis. In the latest edition, the author has widened the scope of his coverage of the subject far beyond the standard Cox analysis that still dominates the medical literature. He does this with the same lucid style and systematic harmonization of theory and practice as before. The key equations are provided, but not allowed to distract the practitioner. Examples are used both to explain all the important concepts and methodologies and to motivate the theory." "Dr. Collett has provided an invaluable resource for all students of biostatistics and epidemiology, whether new learners or long-time professionals in the field. He covers the fundamentals of survival analysis by providing thorough treatments of the theory and underpinnings of the concepts while making the material accessible to the reader by providing numerous real-world examples that nicely illustrate the concepts. In addition, he covers many recent additions to the field ensuring that the text is up to date and relevant to today’s practicing biostatistician. Dr. Collett’s text will be an indispensable resource to all who are charged with drawing proper inference from survival data." "As a master’s student in biostatistics, with a medical background, I missed having a good reference book for survival analysis that is interlarded with clinical examples. Albeit too late for my studies, I was glad to see the appearance of the first edition of this book. It has been a good friend since that time and the second edition—again full of examples of medical data—fulfilled all expectations. … this newest edition remains fresh as a daisy and will certainly join its older brothers in my bookcase." Collett has succeeded admirably in updating the first edition of his book … [This book] has numerous, carefully worked, real-data examples. There is enough new material in the second edition to justify its purchase by someone who already owns the first edition. this text is a fine example of technical writing and remains highly recommended for both students and researchers requiring an introduction to survival analysis in a medical context. … a well written practical guide with a demonstration of SAS software to perform survival analysis. … It can be used as a textbook in a graduate-level survival analysis course … . It is thorough and authoritative, covers all essential theory and contains many practical tips. … a useful book that has particular merit for the applied statistician. Chapters 1-6 and 11 alone supply a wonderful introduction to survival analysis. The mathematical statistician unfamiliar with survival analysis who desires to become quickly abreast will also gain much from the book. Students found the presentation of the material and examples to be very helpful … an excellent book … I highly recommend this book for practising statisticians engaged in analysing univariate survival data. … This book will not only serve the statistical practitioner in the medical and pharmaceutical research areas well, but will be a convenient text for the lecturer aiming to include a useful applied component into a post-graduate statistics or operational research degree course. The book would be a popular text for courses and a well-thumbed addition to any medical statistician’s collection. It is sufficiently general to be of interest to industrial statisticians concerned with lifetime testing but the focus is clearly on survival of patients under treatment.